The NDN Project will host its second NDN community meeting (NDNcomm) on September 28th-29th 2015, the second in a series of meetings. We also held a two-day Hackathon the weekend before the meeting, Saturday September 26th and Sunday September 27th. University of California at Los Angeles hosted the second NDN Community Meeting in the last week of September 2015. This two-day meeting provides an opportunity for the community to exchange research experience and results, to discuss the current state and future directions of the NDN architecture, and to identify remaining issues. We also plan to hold a 2-day hackathon on Saturday and Sunday September 26th-27th, the weekend before the meeting. Based on community interest and submissions, we are receptive to a variety of forms of participation at this meeting, e.g, technical talks, panels, tutorials, demonstrations, hands-on learning. In order to maximize interaction and dig deeper into selected topics, we will have a series of focused discussion sessions that include a few short talks (10-15 minutes), but leaving lots of time for conversation and debate. The NDN project uses current and future applications to drive the development and deployment of the architecture and its supporting modules, to test prototype implementations, and to encourage an iterative cycle of hands-on experimentation, evaluation, and design. So, we particularly encourage contributions that consider specific case studies, application requirements, and real-world scenarios. We are excited to announce the first NDNcomm hackathon at the upcoming community meeting. We welcome participants across all experience levels. Project representatives will pitch their ideas to hackathon attendees and act as guides/mentors. We are also planning projects suitable for NDN newcomers. See the Call for Projects Google doc for more information. Those registered to attend the hackathon should visit the NDNcomm 2015 Hackathon Participant Guide. Presenters, submit PDF slides to webmaster at caida.org with permission to link them to the agenda. All events are in the Macgowan Hall Little Theater except the breakout sessions, which may be held in different locations specified. Presentations will be archived in the day one live stream and day two live stream. Anders Plymoth (TelHoc), TelHoc Borrego -- An Application Service Platform supported with NDN networking. NDN's forwarding-on-a-name approach works best for static content. For data on demand, name space stitching situations (IoT gateways) or cases where names include ephemeral elements like "call-back names", the question arises whether the network should not understand more of the intended usage of the involved name(s) than just forwarding. As an extreme case we have named functions where an interest's name is an arbitrary expression containing several names and where the network is supposed to rewrite the expression depending on its routing knowledge. A pragmatic extension is NDNS with its second (conditional forwarding hint) name. if time permits, discuss in-network extensions where names are rewritten, or mapped, and can be bound to dynamic content. Brief update on recent additions to the NDN libraries, their motivations and design tradeoffs. Open discussion of future features desired by the community, opportunities for participation in development, and feedback on the development environment(s). Technical questions about the libraries welcome. Discussion around the content-based security model of NDN, including topics about: 1) the difference between content-based security model and channel-based security model; 2) challenges in enabling content-based security in NDN app; 3) progress of security support in NDN. Tactical communication network environments are typically characterized as being dynamic, infrastructureless, and resource-constrained. Robustness, security, and reliability are recognized as critical requirements for all tactical systems. The objective of this session is to investigate the use of NDN in such environment. Determine whether and to what extent ongoing research in Named Data Networking (NDN) is applicable to contested environments, and what adaptations must be made for contested environments. Discussion of the Open mHealth and Enterprise Building Automation and Management network environments that are part of the NSF NDN-NP proposal, including 1) challenges from these domains 2) opportunities provided by NDN 3) progress on demonstration applications. This interactive session will be a conversation among NDN developers and researchers about approaches for assessing progress towards the broad technical and social goals of NDN and ICN more generally. As a discussion prompt, we'll examine a developer survey currently under production, in addition discussing evaluation mechanisms appropriate for architecture. In the days right after NDNcomm 2015, the 2nd ACM Conference on Information-Centric Networking (ICN 2015) will be taking place in San Francisco, CA. 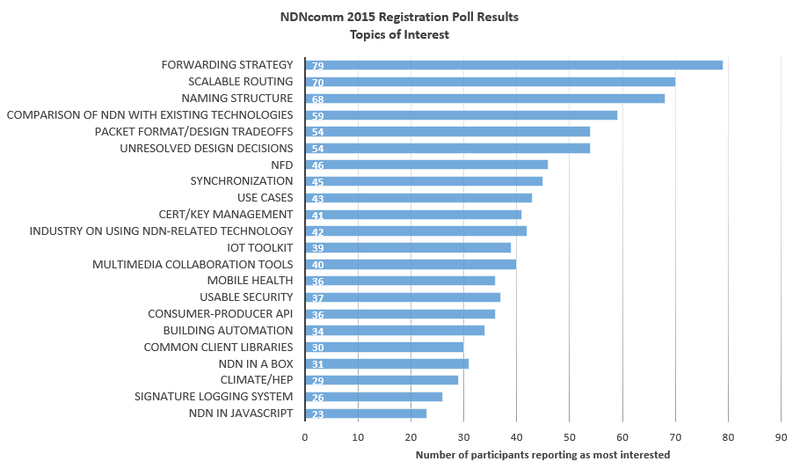 Several NDNcomm participants will be heading to ACM ICN 2015. Registration information can be found on the ICN website. Travel support is available for full-time students attending the NDN Community Meeting (NDNComm 2015) and NDN Hackathon. Funds for these travel grants are provided by the NDN Consortium. An estimate of the following costs of attending NDNComm: airfare, hotel and meals. It is anticipated that travel grants will partially cover these costs of attendance. A statement of whether the student has registered for the meeting and proposed to present a paper, poster, etc. in the registration form. A confirmation that the student is a bona fide Ph.D. candidate or a M.Sc./B.Sc. student in good academic standing at the given institution. An indication about how the student applicant would benefit from attending NDNComm. A statement of financial commitment to pay the remainder of the student applicants' travel cost not covered by the grant. The advisor's letter should be emailed to ndn-registration@caida.org. The meeting will be held in Little Theater in Macgowan Hall on the UCLA campus. The UCLA website provides directions to Macgowan Hall from the east entrance of campus, and a UCLA Campus Map shows Little Theater and its surroundings. The address of Macgowan Hall for GPS and taxi dropoff is 245 Charles E Young Drive East, Los Angeles, California 90095. Parking Structure 3 on Charles E. Young Dr East is closest to Macgowan Hall and the Little Theater. The standard parking fee is $12 for an all-day pass, from the pay stations in the parking structure. The LAX FlyAway Shuttle is an hourly nonstop bus shuttle from LAX airport to a stop on the south end of UCLA campus, 1.5 miles from Macgowan hall for $10 one-way (credit card only, no cash accepted). Please be aware that in order to attend NDNcomm 2015 you may need a visa to enter the United States. Attendees are responsible for attaining their own visas, but we can assist by providing a letter of invitation if your local consular office requires it. NDNcomm 2015 is supported by the contributions of industry members of the Named Data Networking Consortium, including Alcatel-Lucent, Brocade, Cisco Systems, Fujitsu Laboratories of America, Huawei Technologies, Intel Corporation, Juniper Networks, Panasonic Corporation, Verisign, Inc., ViaSat. Local arrangements are in cooperation with the UCLA School of Theater, Film and Television, UCLA Network Operations Center, and UCLA Internet Research Laboratory. NDN research is partially supported by the National Science Foundation (Award CNS-1345318 and others).